Tiny Ted is Theodore and Tilly-Bear's teddy bear. He is not a Vermont Teddy Bear and his story is a simple one. 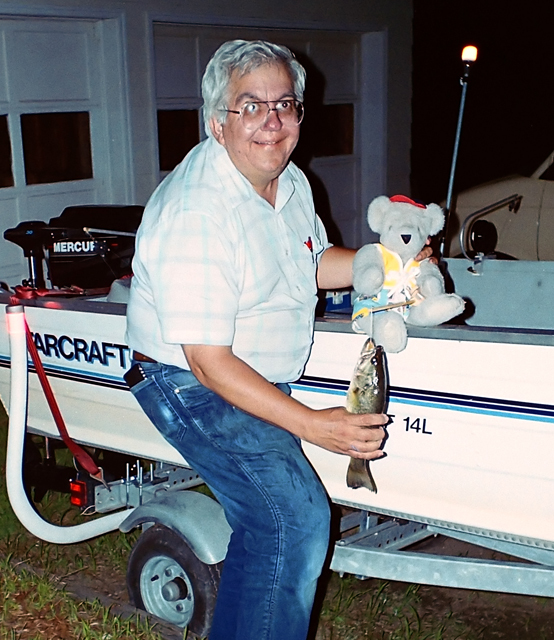 In the summer of 1995, Lance, Dianne, and Theodore (Tilly-Bear was living in New Jersey with Lance's mother then) went fishing on Lake Champlain. The only good catch worth saving was a smallmouth bass. Lance keeps a cooler on the boat filled with water and ice. This keeps the drinks cold and fish from spoiling. The water in the cooler was so cold that day that, by the time the crew got home, the fish had frozen solid. Theodore had his fishing pole with him, so Lance had his wife, Dianne, take a picture of the bass as if Theodore caught it. 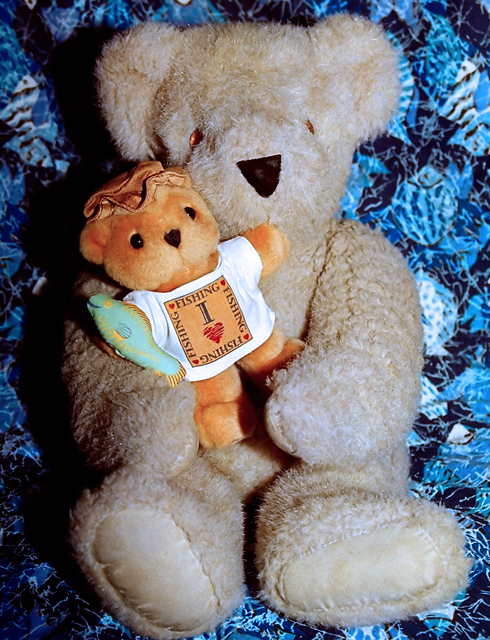 A copy of the picture went to Lance's mother in New Jersey to show Tilly-Bear. Lance's mother thought the picture was a riot because the fish is almost as big as Theodore. Then, a couple of weeks later, she saw a small teddy bear in a store. It had a fish in its paw and a tee shirt that said, "I LOVE FISHING". So she bought the little bear and sent it to Theodore as a gift. Theodore thought it was the greatest gift he'd ever received - his own teddy bear - and he began taking it to bed every night. He named his bear Tiny Ted because the little bear was a TINY TEDDY bear. A couple of months later, Tilly-Bear joined the household and Theodore let her sleep with Tiny Ted to help her adjust to her new home. Tiny Ted owns one article of clothing: A sweater which cost $8.00. This is not a case of extravagance. It came about when Dianne returned something to a store that would only give her credit toward another purchase, instead of a refund. Since she knew she was never going to shop at this store again, she started looking around for something else to buy. The only thing she could find was a very small sweater with the name Ted on the front for $8.00. It was a case of use it or lose it. So, she used the store credit to buy a sweater that would fit Tiny Ted and had his name on it. Not many teddy bears have their own teddy bear with a monogrammed sweater. But we do!